Check here for a signed copy or email us at info@left-bank.com. A superb portrait of family life, THE TENDER LAND is a love story unlike any other. The Finnerans -- parents and five children, Irish Catholics in St. Louis -- are a seemingly unexceptional family. Theirs is a story seldom told, yet it makes manifest how rich and truly extraordinary the ordinary daily experience we take for granted is. 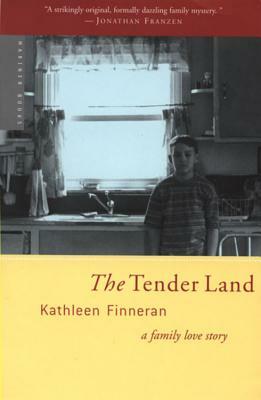 In quietly luminous language, Kathleen Finneran renders the emotional, spiritual, and physical terrain of family life -- its closeness and disconnection, its intimacy and estrangement--and pays tribute to the love between parents and children, brothers and sisters. Ultimately, it is this love that sustains the Finnerans, for at the heart of THE TENDER LAND lies a catastrophic event: the suicide at fifteen of the author's younger brother after a public humiliation in junior high school. A gentle, handsome boy, Sean was a straight-A student and gifted athlete, especially treasured by every member of his family. Masterfully, the book interweaves past and present, showing how inseparable they are, and how the long accumulation of love and memory helps the Finnerans survive their terrible loss. THE TENDER LAND is a testament to the always complicated ways in which we love one another. In the end, the Finnerans are a family much like the reader's own: like every other family, like no other family. KATHLEEN FINNERAN was born in St. Louis and is a graduate of Washington University. She was the recipient of a Whiting Award in 2001. The Tender Land is her first book. She lives in St. Louis.